The Langdale Centre Photography Group started in October 2008 and consists of a small group of adults who have a learning disability and is led by Wendy Martin. Every Tuesday morning they visit places of interest throughout the Blackpool area. With support they are able to channel their creativity to produce photographs such as the ones which will be exhibited as part of Culture Shops. The group have entered their compositions into a number of photography competitions and exhibitions. 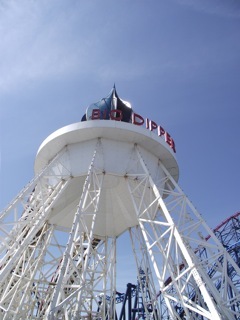 They really enjoy the variety of visiting places of interest throughout the Blackpool area. The group compositions are limited in so far as they are always carried out within an hour’s time and have financial constraints. However the group have been overwhelmed by the kindness of the people who have donated their time or given tours to the group, such as the Pleasure Beach, the old and new tram depot, the Town Hall Chambers and the Grand Theatre to name just a few. All have been fascinating to visit, never mind photograph. Like any group with like minded interests a lot of the time the visits are also nostalgic. This provokes events that have happened in their life, which the group are happy to recollect and record by photography. Over the years the photography group have held two annual exhibitions at the Solaris Centre to raise awareness of learning disability week, which is usually in the last week of June. Photographs have also been entered in the annual MENCAP photography competition. In the first year the group entered this event one of the members received a Runners Up award. In the past they have also entered the Blackpool Central Library competitions. Currently the group have some photographs exhibited at Palatine Library. The Langdale Photography Group really appreciate being included in the Culture Shops exhibition and cannot thank the people involved who have made it happen enough, in particular local photographer Linzi Cason, who has helped to curate our exhibition. Langdale Centre Photography Group will be exhibiting thier work alongside local artists Garth Gratrix, Micheal Cassidy and John Marc Allen from Friday 13th April at Bar Red, St Johns Square, Church Street, Blackpool. There will be a launch event at FYCreatives, Church Street from 6-8pm on Friday 13th April, with a tour of the windows at 6.30pm. Information about the other exhibiting artists will be displayed shortly.